Now that I am 81 posts into this blog (pathetic compared to some of my awesome blogging friends) you have realized one of two things 1) I really am funny or 2) I am blogger who just thinks I am really funny. I am prefer to go with option one. To that end I spend quite a bit of time picking the titles of posts, again because I think I am funny. Guess again. Join the Crowd Learn How To Take Your Dog Everywhere! Let’s get back to the funny part. Look at that title its funny. Maybe it is not funny as a stand alone statement, but it is very funny coming from me. There is no way in hell that I support people taking their pet dogs out into the world to any place that pet dogs aren’t typically allowed. Actually check that, there are some people who shouldn’t take their pet dogs anywhere, permitted or otherwise, but alas I am not in charge of the world. I am sure that I have already posted about this at some point (or hope I did, in my meager 81 posts) that I just find it morally wrong to do this sort of crap. I leave the perpetrators to deal with karma; unless of course they draw me into a conversation about it or ask me where they can get one of those jackets for their dog. I mean if you open the door I am just compelled, much to Dave’s dismay, to walk right through it. I am not alone in the crusade to stop this practice either. 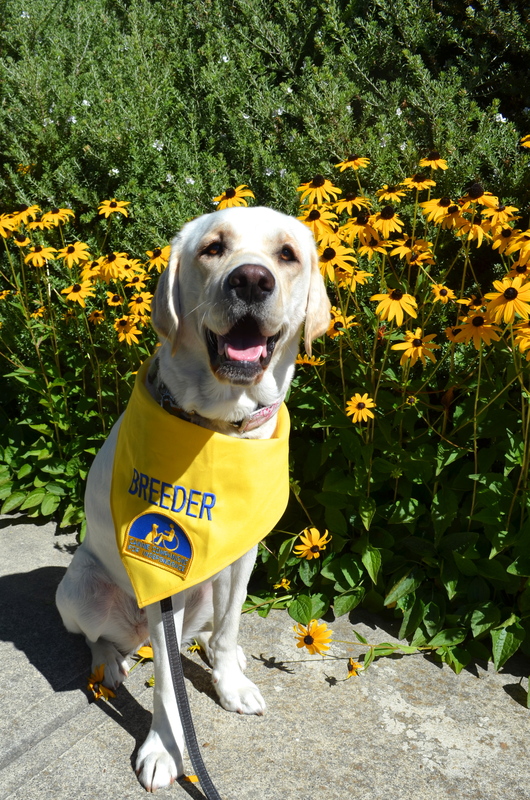 If you haven’t heard, Corey Hudson, the CEO of Canine Companions, has recently declared war on the sale of equipment, vests, ID cards and the like sold to non service dog users. There are a tumble of terms out there – fake service dog, counterfeit canine, etc. which is not in anyway intended to target dogs who are providing assistance to people as outlined by the ADA. It is; however, specifically intended to target people who take their pet dog, well-behaved or otherwise, slap a service dog vest on it and take it to the Piggly-Wiggly. Yes people do that. The other thing people do… is apparently not find me funny. (I know right?) I received a couple Facebook PMs from people who couldn’t believe I would advocate and encourage people to take their dogs everywhere. They thought that I knew better. Shame shame on me. Well I can’t tell you how ridiculous that whole thing is and how obvious it is that they didn’t read the post, and missed just how funny the title was. Very deep sigh. Although I guess I always knew it would just be a matter of time before I made someone mad. Honestly everyone around here is pretty surprised it didn’t happen sooner – or maybe that it doesn’t happen more often. Apparently it is time for me to take my popsicle sticks and go home. I have been told that the first time is always the best, the first thrill, first love, first “fill in the blank” is the best. That the euphoria and excitement that comes with the first can never be recreated. I am not sure about all of that. I have had a couple firsts that were most certainly so terrible that I made sure there wasn’t a second. What I do know is that we all get tired. Maybe not “climb into bed and not get up for a month” tired but things we do in and out can certainly begin to feel and appear lackluster after a while. They most certainly lose the rush or glamour that came with the first. Sometimes the tarnish becomes so embedded that the work to polish it off is greater than the cost of just tossing it out and starting over. I am the all time Queen of I am going to do “fill in the blank”. There is much pomp and circumstance in my proclamation of doing “fill in the blank” and of course gathering the stuff that I am going to need to do “fill in the blank.” Don’t get me wrong I don’t have to have new or shiny, I am happy to go to your garage sale and buy the stuff you needed for whatever craft or hobby you have now discarded. Still despite all that it eventually falls by the wayside. After much introspection I have come to realize that it isn’t really doing “fill in the blank” that is attractive, it is the challenge of learning something new, that I love. Take golf for example. I don’t do it. Why? Because you never master golf, you can’t really learn it completely. That and you’re supposed to be quiet and I don’t do that quiet thing well (I don’t fish for that very same reason.) When you have an hour or two and are willing to buy Dave a beer, ask him about all the things that I have jumped into whole heartedly and then once I reach some level of competence move on to the next thing. Now this isn’t meant to insinuate that I am some super talented master of all of the things I have tried (Not by a long shot.) I am more of a jack of all hobby/crafty trades and master of none. At most you could say that I have mastered the art of being curious and you know what curiosity did to that poor cat. Alas, there have been some constants throughout my life and as of late I have decided that I can find learning adventures in advancing those efforts. 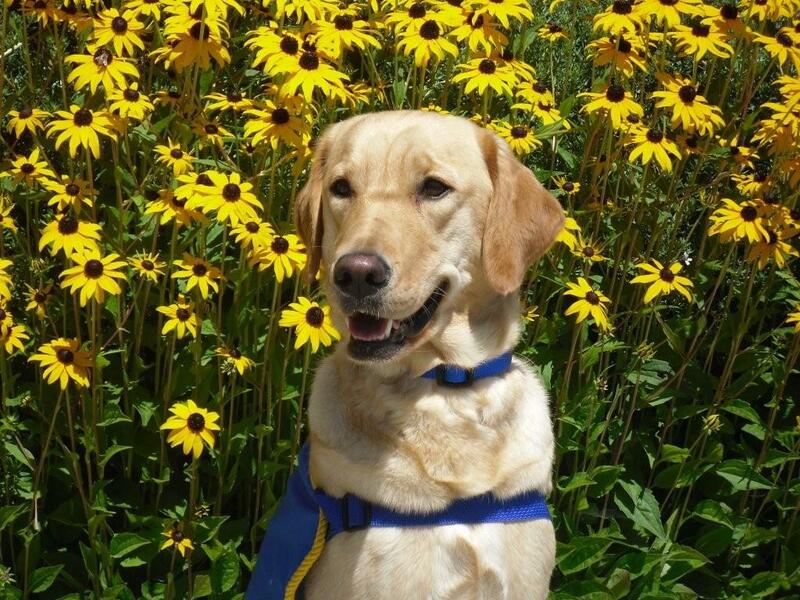 Namely photography, writing, scrapbooking, and now you can add being a volunteer for Canine Companions. That certainly has proven to have staying power. In fact I have told them I will stay as long as they will have me. Yes my friends we are reaching the golden five-year mark in a few short months that Dave and I have been part of this wonderful organization. I am not going to say that it is all fun and sunshine – in fact there is nothing sunshiny about going to puppy class in the rain, having your pup-in-training poop in the middle of the mall, or needing to rush your pup to the emergency vet. However when it is sunshiny it is enough to sustain you, through and well beyond, the occasional heartache that comes in this dog focused life. Last month I had the privilege of attending Canine Companion’s Team 2013 Volunteer Conference in Santa Rosa. Team 2013 truly deserves a post all to its self and despite it being out-of-order chronologically I will save that for another day (look there a departure from my regular blogging style – an adventure awaits!). The conference left me excited in a whole new way about Canine Companions – as much as if not more than the first conference I attended. Instead I will tell you about Friday September 20th. It was another first, and it will stick with me for quite a long time. 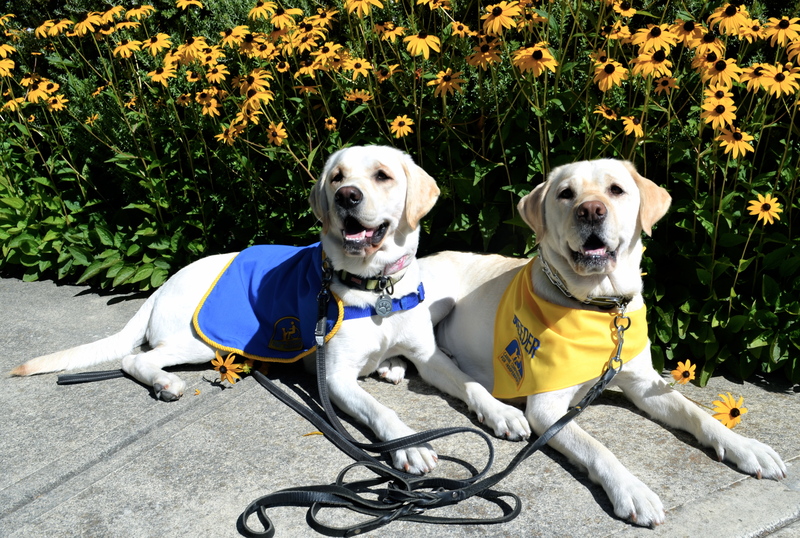 I was in Santa Rosa and on campus to attend the Canine Companions National Board meeting. While the girls were on the play yard there was a tour group out and about on the grounds. This is not uncommon sight by any means, any member of the public can come on tour day and see the digs, learn more about the mission and organization. (There are five regional centers across the United States – check one out!) This was no ordinary tour – these were people who were in the process of becoming a graduate team. Another first – I had not meet so many graduate candidates at one time, and most certainly not crashed their campus tour. Dave and I looked on while National Board Member and Graduate Nancy shared her Canine Companions story with the prospective graduates. I am moved every time I hear her speak. To be honest sometimes she breaks my heart. Nancy is a vibrant, exciting, intellectual woman who uses both a wheelchair and crutches. You should see the look on people’s faces when she “rolls” out of a meeting and then is able to stand and transfer to a car. It probably shouldn’t, but it truly cracks me up every time I see people see it. Anyway something I have heard her say countless times is how she is treated when she is in her wheelchair. I should say how poorly she is sometimes by people when she is in her chair. She will tell you that her service dog opens not only doors literally, she opens doors to people, to communication, to the “normal” world. I know that some people act poorly that way because no one has taught them better, but some people have never tried to learn better either. To them I say – you have just cheated yourself out of the opportunity to meet a pretty spectacular lady. As we started to depart for the Board Meeting Nancy invited me to talk a little about puppy raising and being a breeder caretaker. Of course Sabina obliged the group by “letting” them pet her (she would have been demanded being pet, had it been her choice.) Soon it became apparent that we had held the group for too long and they had to get on to their individual interviews, another step in the journey to graduate team training. Many of you know that one of the things I can’t stand in this life is pity. There was nothing pitiful about this group. They were on campus not to be pitied or to receive a dog out of pity. They were there working with what they had and working for independence for themselves or their loved one – whatever that looks like for them. I am guessing for this group a highly trained service dog fit into their picture of independence. What a great honor to be able to contribute in a small way to someone’s picture of independence. I have no idea if I might see those people at a future graduation receiving their very own service dog or not. I hope I will. For me they were a visual, real live, reminder of why volunteers do what we do for Canine Companions. My paws are crossed for you Cate-Monster, work hard my snuggle girl. Someone is already out there right now working their way to you. I remember hearing that you can never go home again when I was quite little and not understanding it because, well we were always going home. Later I realized – duh – you can GO home (as many times as your parents will let you) but home isn’t just isn’t quite the same home you remember. There are a hundred similar examples – cartoons were on longer on Saturday’s when I was kid than they are now, fireworks were brighter and better at 10 years old versus 40, and when I was 12 summer felt like it was more like 3 years, not the three weeks it feels like now. There has been a little extra spring in my step this week because we get to puppy sit our second puppy raised for Canine Companions – Lucinda and her CCI Skilled Companion friend Wuest. Several people have said “you must be excited that your girl is coming home.” Mmm – well yes and no. You see she isn’t my girl anymore, she isn’t coming home, and I wouldn’t have it any other way. I have said a zillion times on this blog and in person that these dogs have a way of finding themselves in exactly the place. A wise friend once told me it is sort of like being a dentist – some people are meant to be dentists and some people aren’t. Canine Companion pups are just like that – some graduate, some don’t. In Lucinda’s case she didn’t. Instead she went to live with a dog that did, three awesome kids, and a mom and dad who love them all. Every time I see them together I know she is living the good life. Don’t get me wrong we love her and she is a great dog. It is beyond nice to have her here for a visit. (She is the best bed snuggler ever.) Dave and I crack up seeing her doing her puppy zoomies in the figure eight pattern in the back yard, checking out the cat tree for any stray kitty kibble, and playing with the Bean like they never were apart. However as we get close to the end of our visits I know she is anxious to get back to her family – specifically her kids. When Lucinda first went for a test run with her now fur-ever family, it wasn’t a unanimous vote to keep her. Eventually Lucinda one over the one little hold out – who is now her biggest fan. Tonight there were some tears when we were saying our good-byes. It almost broke my heart and yet it was filled at the same time. I was sad that one of the sweetest girls ever, who wasn’t sure of Lucinda to start with, who is about to go on a great family trip, was so sad to leave her puppy. But my heart swelled to know that someone loved Lu-Bugs as much as we do – and it is so so very clear that she loves them – maybe more than kibble! Tonight Lucinda is not at her home, she is a very cherished guest our home. She can’t come home again – at least not with us – because our home is not her home anymore. Her home is not just the greatest home and family a dog could have, it is the only home for her, it’s where she is supposed to be. Dave and I, and all puppy raisers, can’t ask for more than that. If you thought that this was going to be a post about Days of Our Lives – wrong! Sort of…. but it is more like the Days of Puppy Raiser’s Lives. I was just lamenting on facebook the other day what I am calling the “stealing of summer.” As my friends were posting all of their kiddo’s first days of schools (and one very cute 32nd first day of school of a teacher friend) I was wondering what happened to school starting the Tuesday after Memorial Day. Since when does school start in August – or gasp July? Where is the fun in that? It feels like a waste of the long summer nights that are surely still ahead. It is these familiar things that mark the passage of time for me. Like Labor Day marks the end of the season of wearing white, Easter means the bulbs are almost blooming and in Sacramento the passing of ground-hog day marks not only my anniversary but also the beginning of the fog. At any rate all of if seems, the older I get, to be whizzing by. That is until you have a puppy enter professional training. To very loosely quote from a very funny running shirt I saw – the passage of time when your puppy is at advancnced training is slower than a turtle running through peanut butter. I am telling you that from the moment you turn in your puppy until that first puppy progress report seems like there is a pebble stuck in that big ol’ hour glass. Northwest Region Pups after their Class Picture. Certainly not having fun at all. 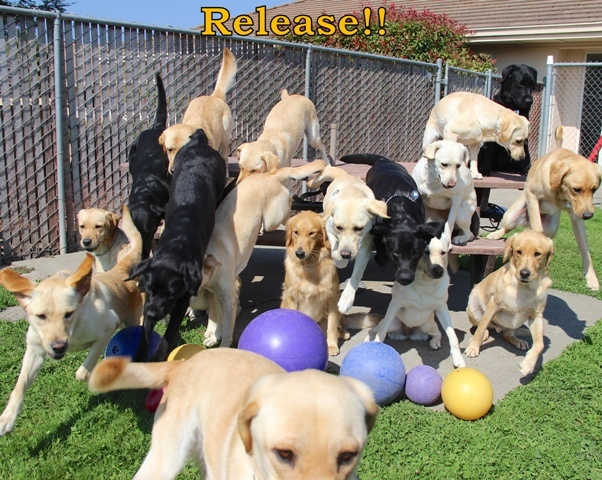 1) The pups have fun at professional training. Particularly the ones that like to work. Yes professional training is hard, the dogs go through adjustments, and it can be stressful – but they also have fun. 2) The trainers love your pups as much as you do. WHAT?? Not possible you say? I have first hand experience with this – they do love your pups and have a very vested interest in their graduation. I was so sad that no one would snuggle and love the Bean (she wasn’t Mama Bean yet) like we did when we turned her in. Who would know how to make her happy like I did? I mean surely no one would scratch her ears just right. Wow – was I wrong – see Truth #3…. 3) Your pups love their trainers too. I have posted about this before, the pups love their trainers and that is pretty much the puppy raiser’s fault. Puppy raisers who uber socialize their pups and trade with other raisers when possible, turn-in great and confident pups who are happy to work for whomever asks. In our case Sabina not only loves her trainer – she loves her more than me. Don’t shake your head, it is true. I have come to terms with it and as long as I stay in her top 5 I am good. 4) This is a necessary step to get to our ultimate goal. 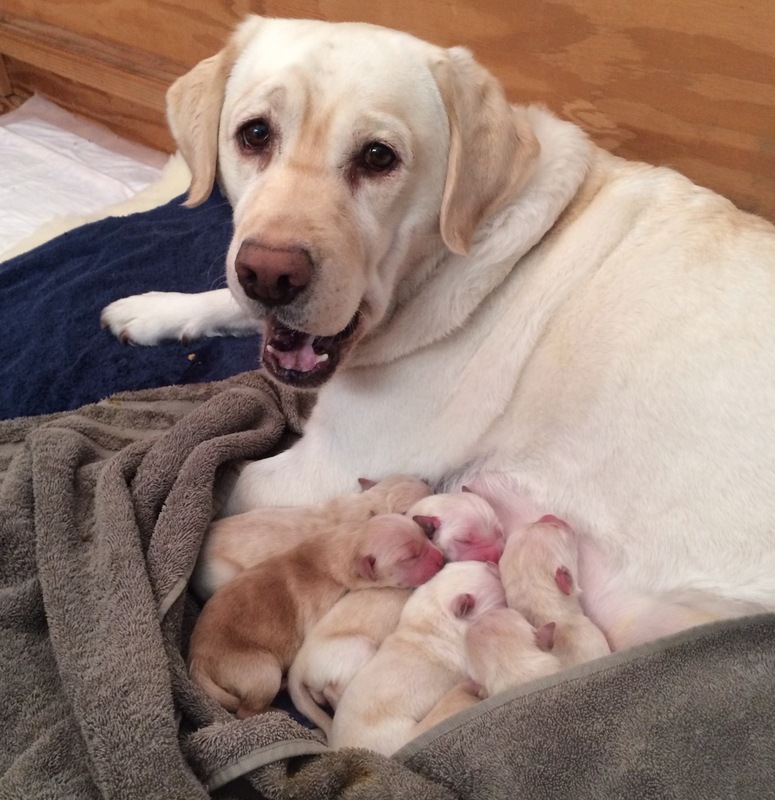 It struck me during our last litter that there is someone out their already waiting for a Canine Companions assistance pup even before they are born. We puppy raisers do a great job, but nothing compares to the training they get from the Canine Companion trainers. Bottom line there is only one way to get to graduation blue – professional training. Cate “testing” out her mama’s breeder scarf. Doesn’t she look good in it? 5) They end up where they are supposed to be. I have yet to see a Canine Companions pup end anywhere except where they were meant to be. This, like many things, is not always something we are happy about or even understand. Our second pup Lacinda didn’t graduate and we were pretty devastated as we had high hopes for her. She is now living with a family that already has an assistance dog for their son. Lacinda is living her dream with a family that loves and needs her. A better place couldn’t be had for her. Lacinda on her turn-in day. So today there are certainly some sad moments knowing that Cate will most likely not cross our threshold again. However it is exhilarating at the same time. For the next six months we will be on pins and needles waiting for the call about what Cate’s future holds. We know whatever it is we will be proud and happy for her. Cate and her mama Sabina on Cate’s turn-in day. Epilogue: On February 14, 2014 – VALENTINES DAY! – Cate Monster graduated with the most amazing woman. There was never any doubt that this was the most perfect match. Truly we never know what the future holds for us or our precious pups. I know on that day I certainly received more than I gave, and my heart was certainly made fuller. Hmmm. I am not sure where to begin. I can tell you that I never intended to stop blogging and think quite often – I need to blog this or blog that. Then I started feeling terrible for being so behind, then work got crazy(er), Sabina had another litter, and well life just sort of happened. I kept feeling guilty for not blogging and would have some great idea for a post, but would think – how to do explain the absence. Finally I decided that I just need to blog and that resulted in at least another month trying to figure out how to start blogging again. Do I just apologize for being gone, do I do a ton of back dated posts because goodness knows I have a ton of material. All the while I trying to figure this mess out I realize how much I miss blogging. I actually have two other blogging ideas but then think if I can’t do one about my first love and passion how can I manage anything else. The voice in my head has the conversation that goes “well if brings you that much joy you would make time”, “if it is that important you would make time”. Sometimes I hate that other women who lives in my brain, and wonder why can’t she ever use her indoor voice? Really shouting isn’t necessary. And then she starts up again going on about how I used to make time, then my mind (and other voices start in) and wander about why I don’t make time if it is sooo important? Then Thompson died. You don’t know about Thompson. I was supposed to be blogging about him. He was our 4th puppy raised for Canine Companions, a Sabina puppy from our last litter. Um yeah – you don’t know about the T litter either because, well – I wasn’t blogging. After Thompson died we were able to bring him home from the vet to rest eternally at his co-raisers home. But first we brought him to our home so that Sabina could say her good-byes. I knew exactly how she would react. She came to his side and nuzzled him, she licked him, checked him for life. It was only a few moments before she knew. She walked away, nuzzled me, and then laid down. She came with us as we made Thompson’s final arrangements. It was a quiet and miserable evening. (and that my friends was the biggest understatement of all eternity) The next day we decided – ok my husband decided and drug me out of bed – that a quiet day at the beach was the gateway back to the new normal. That day and the days that followed I was a hot mess, and I am not ready to blog about it. As I was pulled through that most horrible day and all the days that have followed, by our friends and family, I thought that sitting down to blog would help me get to my new normal. Unfortunately his passing just sort of threw another wrench in the plan and created a whole new set of issues about how to kick-start this blog again. So these pages sat for another week or so. Then tonight I learned of the passing of a very vibrant woman who is new to my life. She has left behind a beautiful family including a young daughter and I for one can not find a single reason for it. As I was sending out a message to our local volunteer chapter I was struck by the fragility of it all. Everything: relationships, life, puppies, children, hearts, china plates, peace in the middle east – everything is fragile. This re-realization of the world’s fragility does not want me to retreat or live in a bubble. It makes me want to be bold, to not waste a moment. I want to live like Thompson and all puppies do – for the now. That day at the beach Sabina had a ball. She basked in the warm sun, tried to dig a hole to China, and chased the surf. I think that human hearts, at least my heart, will take more time to heal than Sabina’s – but she reminds me that it is okay to accept what we can’t change and honor the life we are given by living it to the fullest. This blog is part of me living to the fullest. I am not sure how things will unfold exactly, but I am no longer worried about “fixing” my absence. I just want to get back to why I started – to share this crazy journey of puppy raising, raise awareness of Canine Companions, and have some laughs along the way. I am back – blogging to the fullest.